The second H.P. 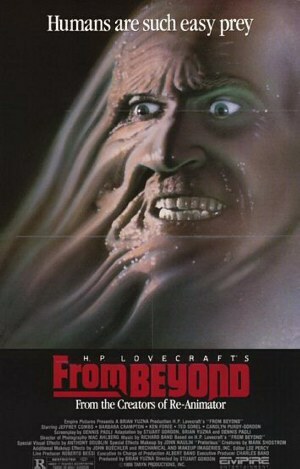 Lovecraft adaptation by Stuart Gordon, FROM BEYOND is pure Lovecraftian science-terror. Out-there scientist Dr. Pretorious (Ted Sorel) and his assistant, Dr. Tillinghast (Jeffery Combs), are working towards breaking through earthly perceptions and revealing a new alternate universe. They do this by stimulating the pineal gland of the human brain, which enables people to see the strange creatures that inhabit a parallel dimension. Unfortunately, these creatures can now see humans as well, and they are none too pleased with it. Dr. Pretorious is killed by the floating monstrosities, but the police blame his assistant for the murder and lock him up. Only Dr. Katharine McMichaels (Barbara Crampton) believes the insane tales of Dr. Tillinghast, and it's up to her to shut down the experiment that threatens to unleash the other-dimensional creatures on this universe forever. Great special effects and solid performances by Combs and Crampton complement a near-perfect realization by Gordon of Lovecraft's vividly detailed and chilling vision of scientific possibilities.